In an extensive list of an eBook reader coming out every day, only a few stand the test of time. You can try many options, some free (either full or for a limited time) and some which you have to pay. Each eBook reader app or device has its strengths and weaknesses. Each has its pros and cons, which ensure that you don’t miss out on any feature of the book. You know these days we have eBooks which will offer not only just text but also much more. In the form of designs, multimedia, annotations, and highlights, etc. All to say that eBooks have become more engaging than ever. And to get the best out of any eBook, you shall need to have an eBook reading app or device. In this context, Mantano reader is something you just have to try as soon as possible. 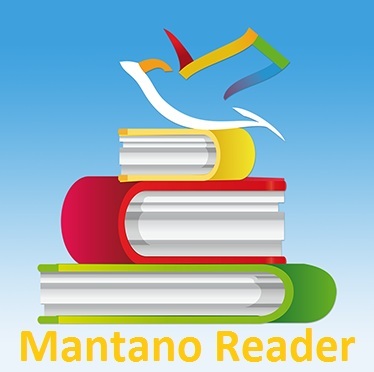 To describe it simply, Mantano Reader is a new generation eBook reading application. The app which comes for free is applicable for smartphone devices. Irrespective of Windows, Android or iOS. Also, When you look at the core support list of this reader, you will find that it supports Epub or PDF formats. Now that’s for every other eReading app which comes out on the market. Most of the new eBook reading applications support Epub and PDF formats. However, what separates Mantano reader from others is that it can load up Adobe DRM technology. DRM is the primary security feature which you can put on PDF files so that no one else can open the files without the password. Usually, as DRM is brought out by Adobe systems, only they provide the codecs to open and view Adobe PDF files on different devices. Having said that, Adobe ensures that such PDF files are compatible with cross platforms like Windows, Mac or iOS. However, it seeks to keep the data as it were when it comes to smartphones. Mantano Reader is a welcome change for that. Here, you will find a ‘Settings‘ gear icon, on the top right of your current page. Click on it to reveal various options which you can tweak up for a better reading experience. Within the ‘Settings‘ find a button which says ‘Adobe DRM‘ which will lead to a pop-up window which has other options as well. Here, you will see ‘Login into Adobe.’ Click and log in with your Adobe account details. Now you can load up and view DRM protected PDF files quickly. You can also view, edit, and share text matters from it. However, if you do not want the account to be active or if you have read the PDF, you can deactivate the Adobe account which you loaded earlier. When we look at the library arrangement of Mantano, you will see that the book is in groups which are smart. You can see that the books are arranged in smart categories and groups. Obviously, this is beyond the general title, author, year arrangement. The app scans the books for tags, genres, reading times ( approx ), etc. and gives them talented groups.But what separates Mantano from other similar eBook reading apps, is its support for OPDS. OPDS (Open Publication Distribution System) is a portal through which you can load up books from external sources. Just put More books for you. You can just insert URL which is hosting the books, into the reader which will within moments load it up into your bookshelf. Also, arrange it depending on various factors and tags. OPDS is a service which is concerning to aggregation, distribution, discovery, etc. of different online books easily within a system. The OPDS system is basing on Atom and HTTP code. It is an open source, free for all system which every eBook reader can put in, but not many do. Therefore, with Mantano you can get your hands on thousands of options within a short period. Mantano operates in the most useful ways. And you can see this idea on the home screen you have as soon as you open the app. The main library consists of two main tabs – which show different purposes. One of the tabs is called Bookshelf. The bookshelf, as the word, is just the library of books, both from within device and outside. Of course, Bookshelf helps us to pick a book as per our wishes and moods. You can go through the bookshelf regarding author or other alternate methods. Also, you have your search bar, within which you can find a book loaded up on the device. On the other hand, the other tab is called BookStore. The bookstore is your window from where you can link your external sites. Online book sites which can stream books and magazines, which you can read on the device instantly. However, you may have to log in on some of these websites. The login depends on many factors like site security, download protocols, premium membership, etc. You can browse your links of websites which are given to the app. Therefore, you can browse and buy any title that you need. In addition to this, you can place URLs for streaming books as well. What happens when you change your device? Or factory reset it? You lose all of your data on your smartphone. You have to re-install all your apps and tweak them to your preferences. This can be painstaking, to say the least. However, nowadays with accounts and sync facilities, You can preserve your settings and preferences across devices and on a cloud. The account will save your data, settings, and habits, and get them back when you log in again. Additionally, you can also ask the app to backup continuously as and when new data is loaded upon. This way you won’t lose the books, your annotations, and your settings values, etc. Whenever you remove the app from your device. Everything is just waiting for you in the cloud. Whenever you install the app on your system, visit the app settings and click on restore to get back all the things you want. With Mantano you get all the more ease of use in reading PDF files. You can use this eBook reader for various reasons. The options that you get for PDF reading are, Fast Scroll, Pan & Zoom, Double Click for layout, etc. Regarding Fast Scroll, you can automate the whole reading of PDF. You can ask Mantano Reader to read the PDF continuously, page wise or go for scroll turns. The app will save the preferences within the PDF files, and go for Fast Scroll. This saves you a lot of time regarding reading through. And it is very convenient when you don’t have to touch anything on the screen. The text flows by itself, and you just have to read it. Pan & Zoom also gives you a greater convenience regarding reading more text than ever. However, you can also change the layouts of the eBooks you are reading in just a click or two. With a double tap on the screen, you can define your layout which comes from Double Page, Single Page, Sentence wise, etc. This quickly changes everything on the screen and arranges books and text in the most useful manner. With multiple devices and eBook reader apps, already available in the market presently, Mantano furthers it more. Of course, it only extends the whole facility to the next level. In doing so, it shows us that Mantano can load up multiple features which help you read almost all types of ePub formats ( including ePub3 format). Mantano’s new feature update will always give you more for the buck when you buy its premier version. Apparently, you can load up Epub at a basic level of Epub3 support, and you can go ahead and skim it. 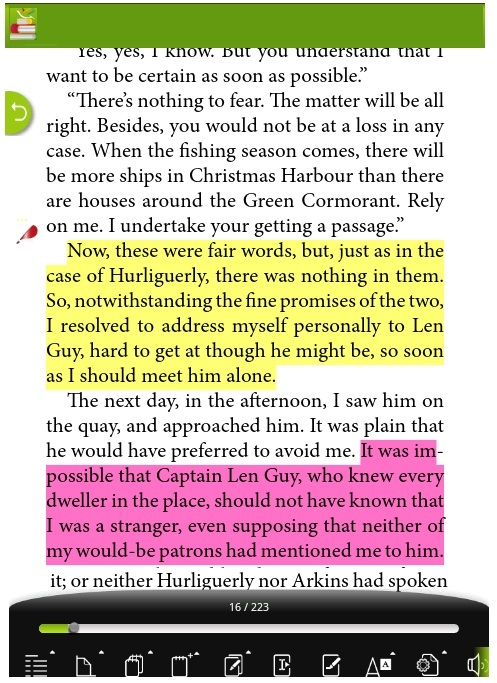 Epub curl effects which allow you to have a more enhancement effects while reading. Of course, when you see pages curl, you get a more involving experience, and this blurs the difference between the physical and virtual enhanced book. Customize the display of Epub, each for one title that you have in your library. The options you get when you choose for Outlay changes are – themes putting in. Themes usually you get here are, Sepia, Black, White backgrounds. But these don’t just stop here. You can, of course, customize the theme according to your preferences. Within this, you can select the color, fonts, page alignment. The best part here is to save these themes, according to each title. This saves time when you want to give different themes for each title. On default basis, you can select the options of Night Mode, Outside, etc. which will adapt your highlights, page layouts, colors, and hues, etc. according to the mode you’ve chosen. 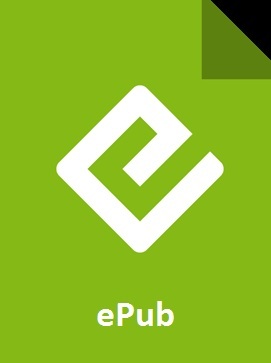 Usually, you get all the great feature of reading ePub files with Mantano Ebook Reader for free. However, there are some features that the app provides after you have purchased the full version of it. The full version which is Mantano Premier, allows you to make notes while you are reading a book parallelly. In addition to this, you can also save all your notes for future reference and get them back from drive backup. Mostly, Notes Manager within this tool comes to help when you want to note down words, phrases or thoughts which will help you read the book more effectively. Also, you can save it on the cloud for restoring it later when you have accidentally deleted the app or your phone’s formated. 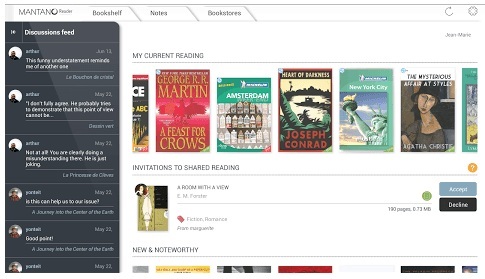 Organize the notes like the books, thanks to collections, sub-collections, and tags. You can also tweak and edit the metadata depend on your requirements. However, you may have to restart the application. This way you can easily get the app to scan and group all the books according to the updated user Metadata. Search a record by a part of its title and text content. How many times have you wondered where did you read this or record that? Well, fret not. With the new Notes Manager, you can search not only the titles of the notes but also the contents of those records. This saves an enormous amount of time spent in searching the notes, books or texts as such. “Review Sheets” can be created by selecting any note within the Notes Manager. Within this, you get the option to go ahead and select a set of notes and give them a modification as such. You can also push the app to review and change all the notes with the inclusions you want for it. Jump to a book from an annotation. This feature is perhaps one of the most exciting features available in the reading app. So this is how it works? You can create a note and save it in the manager. When you visit the note next time, you will see that the note is the group that you want it. However, sometimes, the notes get mixed up and are stacked in an entirely different group. In situations like this, Jump back is the feature which will help. You may open the note, click on menu options, and tap on the jump to book. You can, of course, go back to the page and passage where you last saw the Note entry. Text-to-Speech feature allows you listen to the book than read it. A feature native to AudioBooks which give you multiple options regarding listening to the text material, which we can usually see in ePub reader apps presently. The next time you load up this app from your smartphone, you can switch between reading mode or hearing mode. You can always opt in opt out of the feature, but it does come in handy when you want are traveling or other busy. Tree of Contents is a nice little way of arranging and indexing books within the app. The Mantano Reader does this quite effectively. Various options available on the app’s settings screen let you keep the screen on, while in reading mode. Also, the apps display page number at the top of the document, preferred custom reader screen orientation, enable animations and so on. You can get the maximum benefit from reading a book from within this app. One other feature that you can find in this app is that you can enable/disable Adobe Digital Editions (ADE) sync. This feature is highly useful to load, view and read PDF files which are protected by DRM. You can access these titles with DRM locks, easily by logging into your Adobe account ( or create one when you don’t have one). One more feature that most of us have no idea about usually is the haptic feedback. To simply define haptic feedback, we can refer to this definition. Haptic feedback often referred to as just “haptics,” is the use of the sense of touch in a user interface design to provide information to an end user. When referring to mobile phones and similar devices, this means the use of vibrations from the device’s vibration alarm to denote that a touchscreen button has been pressed. Other eBook features that work great with this reader are – OPDS (as mentioned earlier) library grouping of books. Now, this isn’t just one other feature that adds to it. It works great when you couple it up with defined rules. You need to give the tool some stable rules which will help you go beyond the list of a standard grouping of books. Also the ability to load books directly from drive URL’s is another handy feature. You can download books from the web, and store it on your internal memory. However, when you click on file, you will get options to open it with Mantano reader. Thus, you can load up books quickly within this tool. With Mantano reader you will have a range of features which allow you to read almost all types of Epub and PDF files. With smart features like OPDS system, double-pane layouts and cloud syncing, etc., you will have all the freedom in reading an eBook, in the way you want. Having learned so much about the excellent feature loaded the eBook reading app it is essential to make the eBooks in such manner. Of course, when you have a great book in hand, that’s when you have the total experience. If you are a publisher, you will have to be sure that you are providing the best material to your readers. For this to happen, you will have to approach a professional publishing services company which caters to your needs. Drop us a mail, and we assure you that your work will come out as the best output possible.